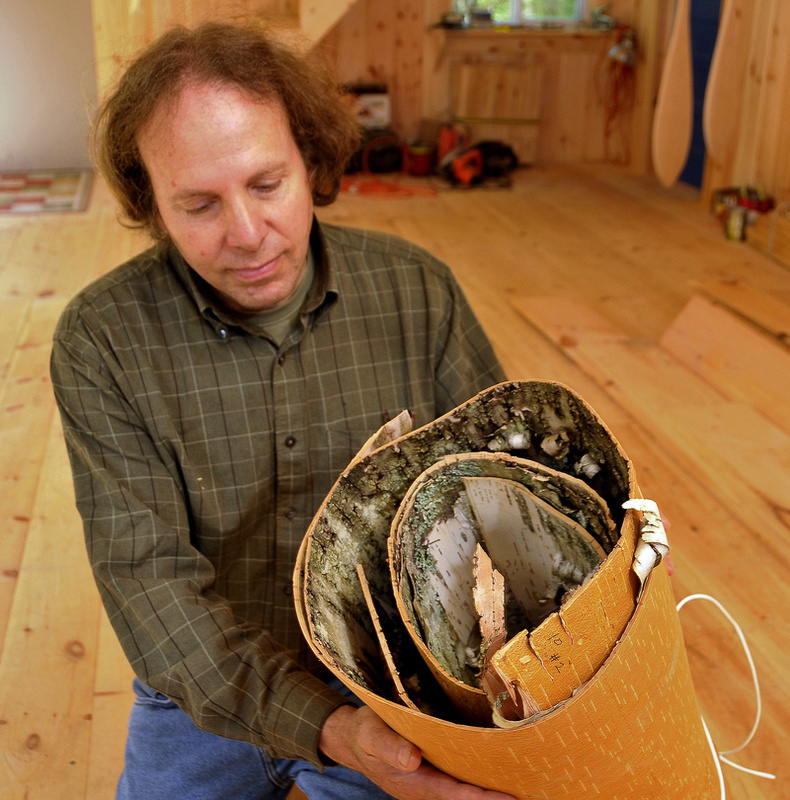 A Maine craftsman who has become a master at building birch bark canoes is called on to teach American Indians the ancient tradition. WELLINGTON – Steve Cayard lives with and in the outdoors, and has thrived there. His house runs off solar electricity; the indoor toilet is a composting system; his garden provides much of his family’s food. And beside his home, tucked far back in the woods, sits the workshop where he builds birch bark canoes according to traditional American Indian methods. Most recently his life’s work has called for a third building to hold future classes in this art form. 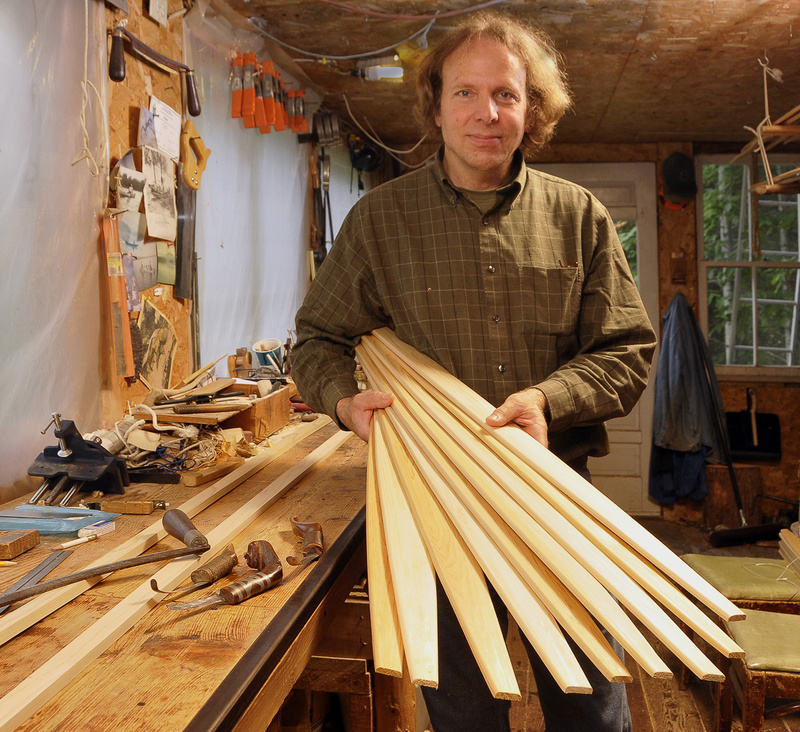 While Cayard prepared last week to teach the second annual birch bark canoe workshop in Searsport for members of the Wabanaki tribe, he reflected on how far he’s come. A dream 15 years ago when he first began teaching courses, Cayard now is a recognized scholar and master of traditional birch bark canoe building. He has taught American Indian tribes this authentic method on Indian Island in Penobscot County and in Edmundston and Fredericton, New Brunswick, Canada. This summer he will teach the workshop for a second time at the Penobscot Marine Museum in Searsport in a demonstration that is open to the public. What started as a love of trees and the peace found in the woods has become a continuing course in Indian ways, meanings and traditions. Today Cayard lives all of it. “I think the Native Americans belonged to the land as much as anything. I feel like this (art) was something that evolved in relation to the land itself. And the plants and animals are almost the teachers one can learn from,” Cayard said. Since Cayard started leading workshops on Indian Island, his knowledge of this art form has been sought after, passed on and shared. 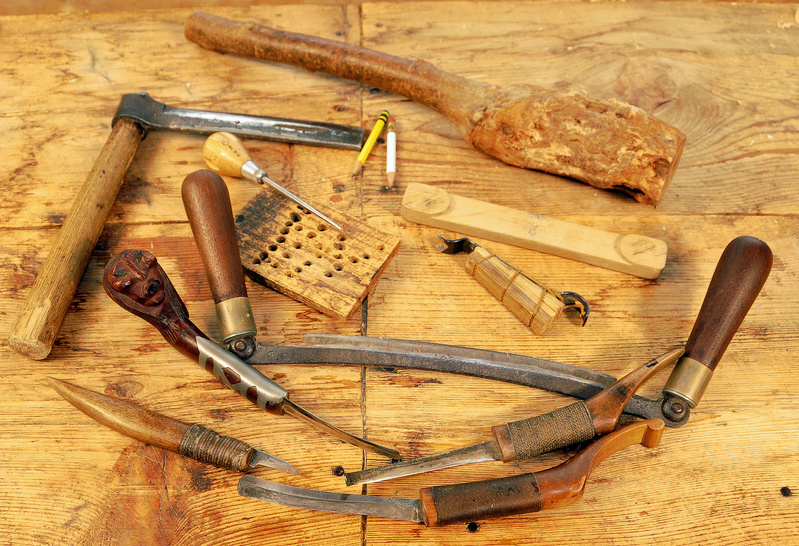 “The purpose was to rejuvenate the art of birch bark canoe making. People had the knowledge of how to construct a birch bark canoe, but they hadn’t the hands-on experience for a long time,” said Maria Girouard, the director of the Indian Island cultural department. Girouard said it was the lumbering industry that led to a decrease in this tradition because the large birch trees needed to build a birch bark canoe were taken off the landscape. Now, she said, people are hungry to learn this practice. Since this passion was rekindled locally, the interest doesn’t seem to have waned. The Passamaquoddy Tribe has applied for a national grant to bring Cayard to Peter Dana Point in Washington County to lead a demonstration. And Bob Holtzman, the marketing coordinator of the Penobscot Marine Museum, said last summer’s demonstration created a unique opportunity. Passers-by stopped to take photographs and ask questions. They would stay for hours, Holtzman said. While there are traditional birch bark canoes around Maine in museums, such as in the Maine State Museum and the Abbe Museum in Bar Harbor, they are not so common around the world. Those that exist are treasures because they are products of an ancient, little-known art form. Cayard’s life’s work has begun to change that, far back in the woods away from the sounds of civilization. 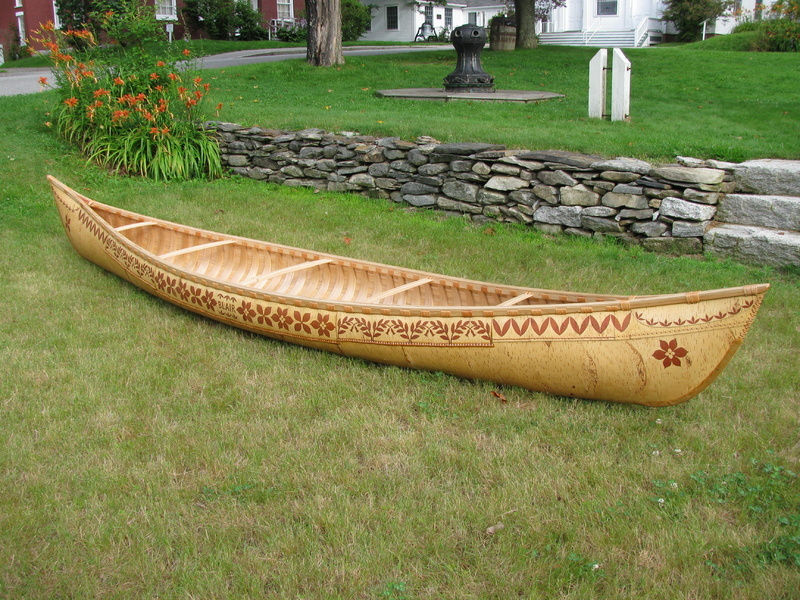 “With the birch bark canoe, it is not about asking the material to conform to what you want. It is conforming to the nature of the material. The design of the material is based on the quirks of the tree. But the design goes back thousands of years,” Cayard said.